Novelist, poet, and playwright Thaïs Miller interviews Sara Batkie about her story collection, Better Times, research and the imagination, and the writing process. The stories in Better Times span numerous landscapes and time periods. If you could live in any time period other than the present, which time period would you choose and why? And if you could live anywhere in the world, where would you live? I never know how to answer that first question, because there’s almost no time in history when it would be better to be a single 30-something woman with an unextravagant income. I guess Jane Austen made it work in regency England but I’d probably end up dying of tuberculosis or some other now-preventable disease. I suppose it would’ve been cool to live through the social upheaval of the 60’s, although both my parents were alive and neither of them went to Woodstock. Nobody actually gets to be Forrest Gump, always there at the right time in history. So maybe the 20’s specifically if I could be in Paris with Hemingway and Gertrude and all those others. The second question is much easier: if I could live anywhere in the world, it’d probably be one of those Greek islands where everyone’s always busting out into ABBA songs on beautiful beaches. I’d either get a lot of writing done or none at all, but I’d be happy either way. Many stories in this collection examine Americana (the history, culture, artifacts, and ethos of the United States) with a twist. While all of the stories feel very realistic, several stories include surreal, magical realist, and fantastical elements. How do you balance research with imagination? I always try to keep in mind something that E.L. Doctorow said in the craft class I took with him at NYU, which was that research is a good thing, and sometimes vital to get certain aspects of a story right, but you must be careful for it not to become another form of procrastination. Do just enough research to spark your imagination and trust that’s enough to write something authentic to a reader. Research can be helpful in letting you know when you’ve gotten an important date wrong, but rarely when trying to capture how a place smelled or a piece of clothing felt to wear. So while, to take one example, the story “When Her Father Was an Island” was inspired by an obituary I found for a real man, Hiroo Onoda, who served in the Japanese Imperial Army during World War II, I felt free to deviate from the actual hard facts of his life when necessary. Ultimately if someone’s too busy nitpicking that you got a certain fact wrong it’s because the story you wrote wasn’t dramatically compelling enough to distract from the liberties you were taking. When you sit down to write, before you put pen to paper, do you already know which stories will incorporate these elements or is the writing process an act of exploration? Generally speaking, yes I do. Non-generally speaking, not always. I didn’t know when I first started writing “Cleavage,” for instance, that a phantom breast would become the animating factor of the plot; I’d written a fairly straightforward account of a young woman having a mastectomy that had some nice ideas but was pretty inert and unexceptional. It wasn’t until reading a New Yorker article about an experimental medical treatment for phantom limb syndrome that I realized what was missing. But for the most part if a story is going to have some kind of fantastical element to it I know that before I begin. I’m not trying to M. Night Shyamalan anyone here, especially not myself. What’s your method for writing first drafts? It can be different depending on what I’m working on. With novels, I usually will write the first draft of each chapter by hand in a notebook and then edit through while I type them up. I find this to be more freeing, which is important when writing something longer. It gives me the sense that I’m following a flow, and not worrying too much about mistakes or a bad sentence or word, so I can get where I need to go and make discoveries along the way. With short stories, by and large, I write first drafts on my laptop. Because the structure is more limited, I tend to be more unforgiving with the writing, lingering over paragraphs and even words for longer than I probably should, or chucking something wholesale if I feel it’s not working as I want. It’s slower but I’m also usually happier with my first drafts that way. Do you use any unique exercises or techniques to guide you through the writing process? I don’t know how unique these techniques are, but I’m a note scribbler. I’ll very loosely plot out a story on paper, connecting scenes I’ve thought of with arrows that point downward and upward or circle around as I work out the structure. And I’ll jot down metaphors or small details, a scrap of dialogue, even potential character names, as they occur to me and come back to them later. It makes sense to me but probably looks like a crazy bramble of nonsense to anyone else. For novels I’ll sometimes write character traits out on notecards but I very rarely do that for stories. I also keep a note in my phone app specifically for crazy things my father has said and that I hope to use in my work eventually. Everyone does that, right? How would you describe your writing process for this collection? How long did it take and when did you know it was a finished book? The writing process was haphazard. The first story in it was completed over ten years ago and the most recent in 2016. Between them I moved from Iowa to New York, went to grad school, worked in publishing, and worked as a programs director for a literary non-profit. I was also maintaining friendships, having bad boyfriends, and becoming an aunt. So I try not to be too precious about writing every day. It happens when it happens and I do my best not to beat myself up if I don’t always meet my goals. The wider world usually has beating us up covered, so we should be kind to ourselves about these things. At some point I realized I had enough stories that made sense together thematically as a collection; I did some rearranging of the order but mostly knew I wanted the stories to fall into the three categories they’re in in the finished book. I also knew that it’s very difficult for agents to sign story collections to publishers. I also don’t have an agent, so I decided to enter the book into some contests and see what happened. And I was lucky enough to win one that included publication. Which story was the easiest to write and which story was the most difficult? I suppose the aforementioned “Cleavage” was the most difficult, because over the course of several drafts and years I was learning how to be a better writer through it. The subject matter and wanting to be delicate without being soft was also a challenge. The lead character isn’t unlikeable, per se, but she’s certainly no model cancer patient. Because, really, would any of us be? The easiest, in the sense that I think it changed the least from first draft to finished story, was “Lookaftering.” For whatever reason once I got the idea it just kind of poured out of me. Perhaps because it’s one of the more fantastical stories in the collection a part of me realized I had to get it all out before I started second guessing the believability of the premise, or worried too much about readers wanting answers to its central mystery. I was also in the midst of falling for someone at the time and that story is in part about love and partnership so that probably didn’t hurt. The drafting process lasted longer than the relationship, but I guess I got what I needed from it. Out of all of the stories in the collection, do you have a personal favorite? I do, but like parents with their children I would never admit to which one. Your collection paints tremendous portraits of the experiences of American women. How did you get under the skin of these different characters? I saw Amy Bloom give a talk once where she said something along the lines of, “Who you are seeps into the space between the letters.” It’s not quite right to say that any of the characters I’ve written about are me, certainly in any strict autobiographical sense. I had a fairly typical Midwestern upbringing that didn’t offer much in the way of drama or adventure (and I definitely don’t mean that in a bad way). But their concerns are mine, their fears are mine, often their hopes are mine. They’re just reflected in the funhouse mirror of fiction. I’ve never been in a home for wayward girls, for example, as the narrator in “Laika” is, but I definitely know something about feeling underestimated by those around me, particularly as a teenager. I’ve never been trapped on an ice floe, like the characters in “Those Who Left and Those Who Stayed,” but it’s my firm belief that the core being of my self wouldn’t change that much if I was. A writer can imagine herself into any time period and into any mindset, even an evil one, but it won’t be authentic unless there’s some kernel of personal truth in it. You’re seeing the most successful skins but there were many I tried on in the course of completing this book that weren’t the right fit and ended up abandoned. In addition to writing fiction, you also write wonderful music, film, and television reviews. Which musicians, shows, and directors inspire you the most? I’m a glutton for all mediums. I think any artist worth their salt should be, to some extent. Film is probably closest to my heart after fiction; I minored in it in college, and a perfect film works for me in many of the same ways a perfect short story does. My favorite directors split into two camps: there are the ones like Billy Wilder and Jonathan Demme and Robert Altman, who work in a lot of different genres and styles, but have a voracious and generous interest in a wide range of humanity. Then there are the ones like the Coens or Jane Campion or Pedro Almodovar, who definitely have a distinct authorial touch but can almost always be counted on to produce something compelling even within their narrower interests. With music I’m often drawn to wordsmiths like Leonard Cohen or Neko Case or Paul Simon, people who are able to tell a whole story in the span of a few minutes. I also like artists with unique voices and viewpoints like Nina Simone and Talking Heads’ David Byrne and Radiohead’s Thom Yorke, all masters of activism and anxiety. That said, I rarely ever listen to music with words when I’m doing first drafts. It’s too easy for them to work their way in. Would you be willing to share more about your next project: the novel you are currently working on? I’ve been working on a novel for over four and a half years now. It’s gone through a lot of changes in that period but essentially it’s about time travel and feminism and how the private treatment of women’s bodies is inextricable from their public lives. I want to walk a fine line between satire and sincerity, to capture something about how the conversations around feminism often change but the need to work together for the common good remains the same. I have no idea if I’ve succeeded. Hopefully soon we’ll find out. Sara Batkie is the author of the story collection Better Times, which won the 2017 Prairie Schooner Prize and is published by University of Nebraska Press. She received her MFA from New York University. Stories of hers have been honored with a 2017 Pushcart Prize and a notable mention in the 2011 edition of Best American Short Stories. 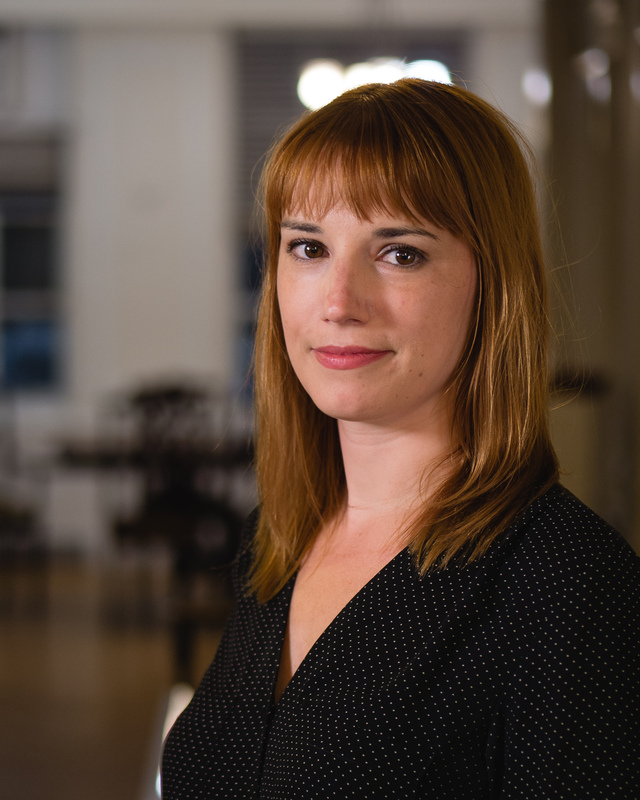 She was born in Bellevue, Washington, and grew up mostly in Iowa, but currently makes her home in Brooklyn where she works as the Writing Programs Director for The Center for Fiction.